Investors should be applauding these two companies teaming up. Like Leonardo DiCaprio and Kate Winslet, Paul McCartney and John Lennon, or peanut butter and chocolate, collaborations between great entities can result in blockbuster results. So you can imagine my heart was aflutter when I heard two of my favorite tech companies, Amazon (NASDAQ:AMZN) and Texas Instruments (NASDAQ:TXN), were collaborating on an integrated offering for the Internet of Things. The Internet of Things is really the ability of devices to talk to each other or a central hub over a network, and the possibilities of this technology are big: It's estimated that there will be $7.1 trillion worth of connected devices in the world by 2020. These devices will open up whole new business models and abilities for corporations to gather, analyze, and react to data in ways they never could before. At its recent Re: Invent conference, Amazon announced a slew of new products and services centered around its Amazon Web Services platform. One announcement was AWS FreeRTOS, a new open-source operating system for microcontrollers in IoT devices. A microcontroller is exactly what it sounds like -- a small computer embedded inside another product or device, which usually has a limited but specific functionality, and which consumes very little power. For instance, your car, television, and microwave all have specialized microcontrollers inside them designed for specific tasks. Texas Instruments is an industry leader in microcontrollers, which are included in the company's embedded processing unit. Embedded processing grew revenue 17% and operating profit a whopping 45% last quarter, leading to strong gains in TI's stock. As the Internet of Things will embed microcontrollers in just about every type of device imaginable, both Texas Instruments and Amazon should benefit greatly. That's why the two companies teamed up early to integrate Texas Instruments' SimpleLink MCU Platform with FreeRTOS prior to the new operating system's unveiling last week. The collaboration will essentially make the combined microcontroller easily pluggable into Amazon's IoT platform. Through FreeRTOS, developers can more easily program, connect, and monitor their devices. That will save IoT software developers lots of time and headaches and can speed up deployment for businesses that want to quickly implement IoT devices. Amazon and Texas Instruments -- a match made in heaven? Image source: Getty Images. Amazon and Texas Instruments both share a similar business philosophy which is laser-focused on return on invested capital. Texas Instruments actually has an entire 40-slide presentation on its investor relations page, detailing its philosophy and commitment to prudent capital allocation. Similarly, Amazon is shaped by its founder Jeff Bezos, who outlined his operating philosophy in his 1997 letter to shareholders, which I think is required reading for any investor or business leader. One passage seems especially pertinent today after the company's meteoric rise: "When forced to choose between optimizing the appearance of our GAAP accounting and maximizing the present value of future cash flows, we'll take the cash flows." The Internet of Things is a big growth industry, and many companies are vying for a piece of the pie. 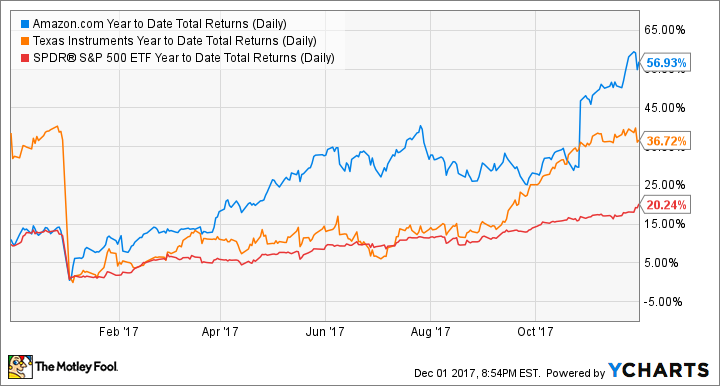 With the chip-focused Texas Instruments and infrastructure- and software-focused Amazon teaming up, it's easy to see both companies being wildly successful and continuing to build on their strong 2017 performances.